“Social Media” refers to websites and applications that provide a platform for users to share content and network in a virtual environment. For many people, these platforms have become ingrained in our daily lives. We gather in the virtual world to organize, discuss, share and entertain. Some may criticize these methods for preempting the need for face-to-face interpersonal discourse, but one thing is for sure; these methods and platforms are a pervasive part of modern culture. No matter what the social implications, if we are going to use these tools, we should all know how to use them safely. Sharing is a double-edged sword. The benefit is that gives our friends and family a window into our lives. The cost is that it potentially allows strangers the same view. Are you willing to share your political views with potential employers? How about your family vacation plans with potential home intruders? Identity thieves regularly access your social media accounts to gain clues about your personal life that will help them gain access to more lucrative parts of your life, like your banking accounts. Below are some links for the privacy controls of popular social media platforms that will assist you in tailoring your privacy profile settings. We recommend that you only allow as much access as you are comfortable with and no more. Other: Many social media platforms exist, and new ones become available frequently. Each should have a privacy center with instructions on how to restrict access to your shared content. A word of caution, social media platforms often change privacy policies and settings without warning. While it is important to remain aware of these policies, you should always assume that you have forfeited your expectation of privacy with anything you share on a social media. We recommend checking your account settings a few times a year to verify your settings are correct and take advantage of any additional sharing options that may have been recently added. Although consumers rarely take this step due to the large amount of verbiage in these clauses, it is an important piece to protecting your privacy. Learn more about privacy policies. Social media permissions are what enable social media applications to integrate with other applications and devices. Begin to build a profile on a user and discern within a reasonable doubt where a person works, where they live, who their friends are, etc. Using this information. Issue targeted-marketing campaigns based on demographic information gathered from social media. Affect your life through social engineering, perhaps by stealing your identity or even worse. Share information automatically across different applications and networks. Someday, Sarah will have to find a job (perhaps in public sanitation). It is a fair assumption that everything posted on the internet will be around “forever.” Using the internet’s wayback machine (and similar tools), the public can see past versions of webpages. This means that even after something has been taken down (perhaps an embarrassing incident of oversharing), you should assume that the information, post or photo will remain online in some form or another. Therefore, being aware of and appropriately managing Social Media Permissions will help a user maintain their privacy and security. Facebook is the perfect example of why managing social media permissions is important. Below (Figure 1) is a chart of which permissions are used by Facebook and the justification for each. If you add a phone number to your account, this allows [Facebook] to confirm your phone number automatically by finding the confirmation code that we send via text message. This allows [Facebook] to improve the app experience by pre-loading News Feed content. These permissions allow you to import your phone's contacts to Facebook and sync your Facebook contacts to your phone. This allows you to see your Facebook events in your phone's calendar. This allows the app to show your calendar availability (based on your phone's calendar) when you're viewing an event on Facebook. The most important thing you can do to protect yourself is to limit app permissions. Applications should be configured to give them the lowest possible level access. Be aware of what the “default” settings and how to change them. Have you ever had that friend who obsessed about a social media game called “BarnTown” and kept wanting you to login so that he could get 10 free sheep?! Hopefully not, because “Barntown” is a name that was made-up for this example (to protect the guilty). If you enable BarnTown, it is also able to read contact lists, messages, logs and view/change pictures from the user’s social media page. The developer then “farms” out the data to advertising companies, making a pretty penny! Third party developers may create their own apps based on popular social media platforms. 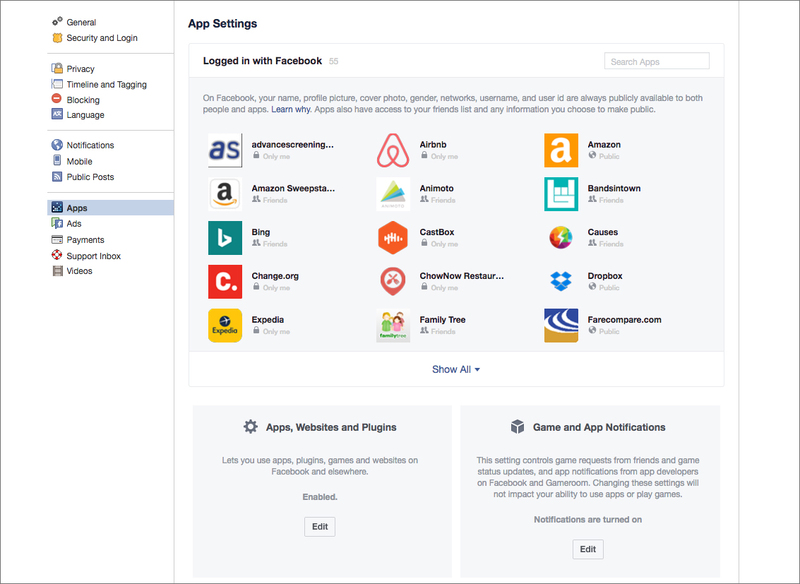 When users connect third party apps to their social media accounts, users are essentially granting those third parties access to their accounts. Those third party apps are now free to read messages, friend lists, activity, view pictures, etc. It is a good idea to only allow third party integrations from sources that you use and trust. If you don’t use a third party app or game that ties into your social media, delete it! If you are unsure of a company or app, it would probably be a good idea to do some research before allowing it to access all of the information on your social media account. Better yet, if there is any doubt, don’t install it!